I suppose I should tell you that's there's not one egg in this nog, but believe me when I tell you that it's truly delicious and pretty close to the genuine article. It's not quite as thick as the original, but it's close! 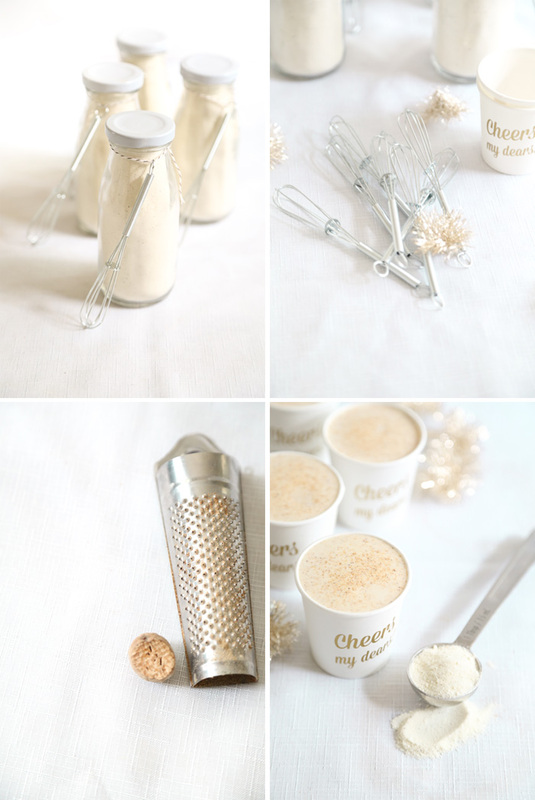 This instant mix keeps for up to six months, so if you're like me and crave eggnog after it's gone from grocery store shelves, then you'll appreciate this recipe! I whisked up two batches of this mix to give as Christmas gifts. I think milk bottles make an extra cute presentation (you can find the ones I used here), but you could also use 8 ounce mason jars. And how about those mini whisks? So cute! They definitely do the best job of mixing the powdered eggnog into the milk. I found a set of 12 minis here, and they look really adorable tied to the bottles with baker's twine. This recipe calls for buttermilk powder, which can usually be found in the baking aisle at grocery stores (sometimes called 'buttermilk blend'). If you can't find it there, you can order it online. The adorable "Cheers!" cups can be found at Sucre Shop. Whisk together all the ingredients in a large bowl. Store in an airtight container, or divide into 8 ounce milk bottles for gift giving. 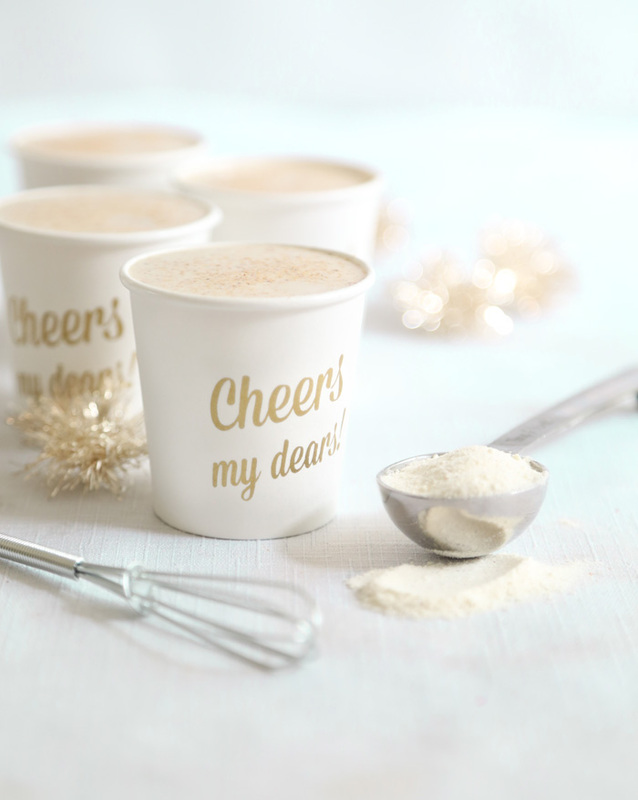 Eggnog mix can be stored in a cool dry place for up to 6 months. 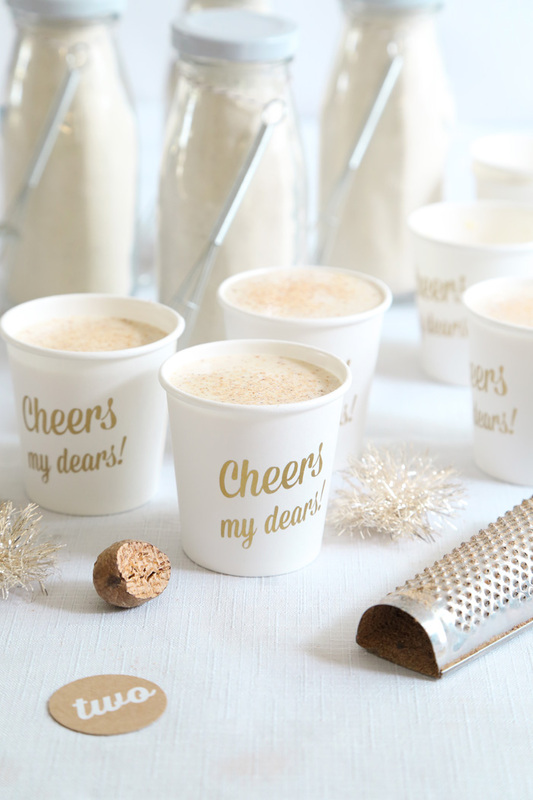 Add a note to each bottle with these instructions: To prepare a glass of eggnog, add 4 to 5 tablespoons of eggnog mix to 6 ounces cold whole milk. Whisk until well blended. Let stand 2 minutes; enjoy. Oh this is really so nice for holiday season! Thanks so much. This is a great gift idea. Love how you packaged yours. Thanks, Joy! Quick question - why the buttermilk powder? I meant, Heather not Joy! So sorry! The buttermilk powder adds a subtle layer of flavor. It doesn't make the eggnog taste like buttermilk. It just adds richness and a slight tang. 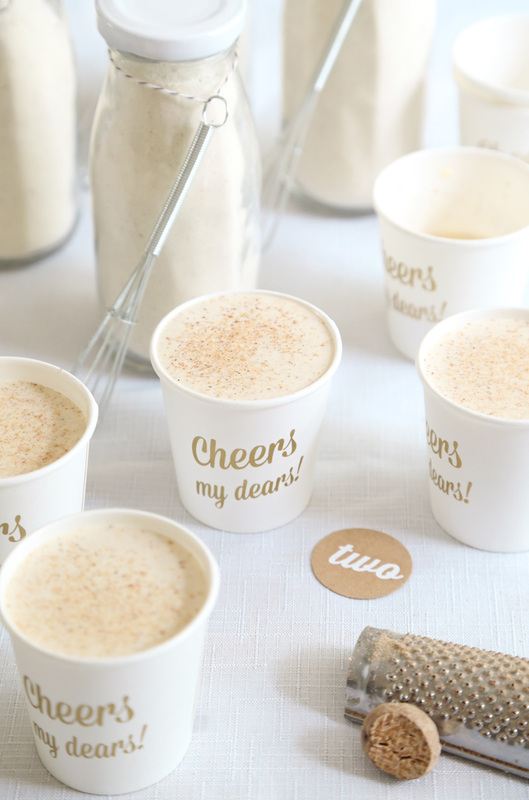 I'm both impressed that it tastes like eggnog without eggs and that you managed to make an instant version. I'm all about homemade drink mixes! Love everything about this. SO CUTE! Is it possible to add it to coffee for a latte? I'm going to try this. Would dried egg whites add anything to the mix? I love your recipes! Can I use buttermilk baking mix or is that different than buttermilk powder? Hi! Buttermilk baking mix has flour in it, usually. So that's not suitable to use in this recipe. Look for buttermilk powder, which is just liquid buttermilk that has been processed to remove the water. The ingredients list should be pretty short. The ingredients may include any of these: cultured buttermilk, buttermilk powder, whey. Also look for mixing instructions. If it gives instructions for reconstituting the powder into buttermilk then you've got the right product! I hope this helps! Thanks for asking!!! I accidently got sugar free pudding! Willv this affect the taste? Will it make a difference if I make it without the buttermilk powder? I've only got a few days, and my local stores don't sell the buttermilk powder.